Kevin and Frank zero in on our home for the night, the famed "Wall of Mice"
Kevin was itching to kick off the volcano skiing season, and since Cinco de Mayo was opening day at Mt. Rainier's Paradise after a winter of road repair, we decided to try Mt. Baker instead. The weather window looked questionable, with high clouds forecast for Saturday, possible showers for Sunday - and of course, a nice day on Monday. Kevin and I had both worked Friday night, he getting off at 7:30 AM on Saturday, so we met at my house at a civilized 10:45 AM. The drive was smooth right into Glacier, where we stopped off for caffeine at Graham's store and hit the Park Service toilets before heading up the road to Heliotrope Ridge. 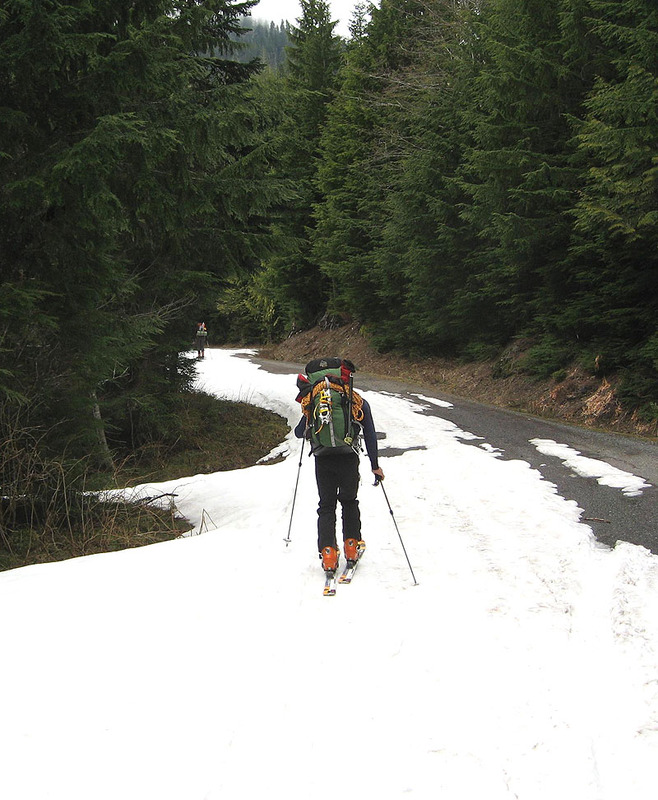 We were able to drive to within a mile or so of the trailhead where we found a number of cars parked on the shoulder, loaded up too-heavy packs, and started skinning. 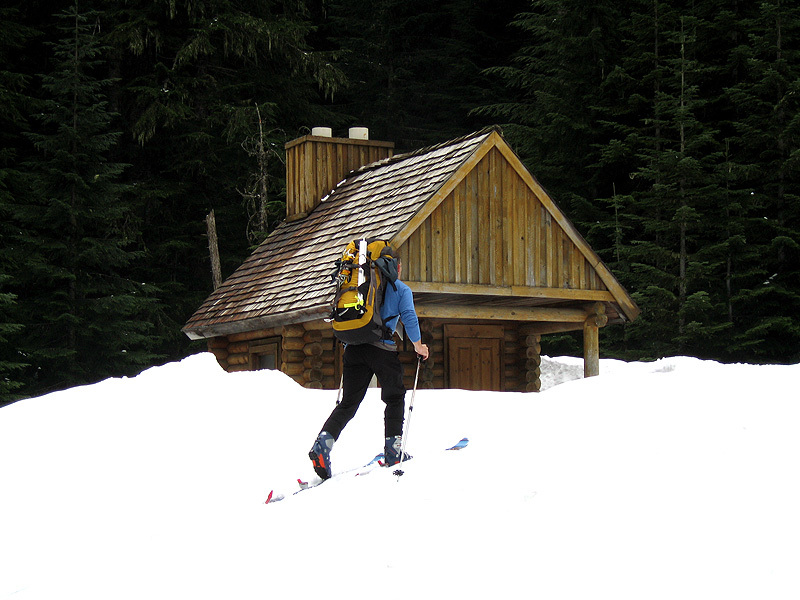 When we reached the log cabin-style restrooms and took a look at the muddy bog of a summer trail from the trailhead, it was a no-brainer to follow the skintracks heading out over dirty snow past the privy. 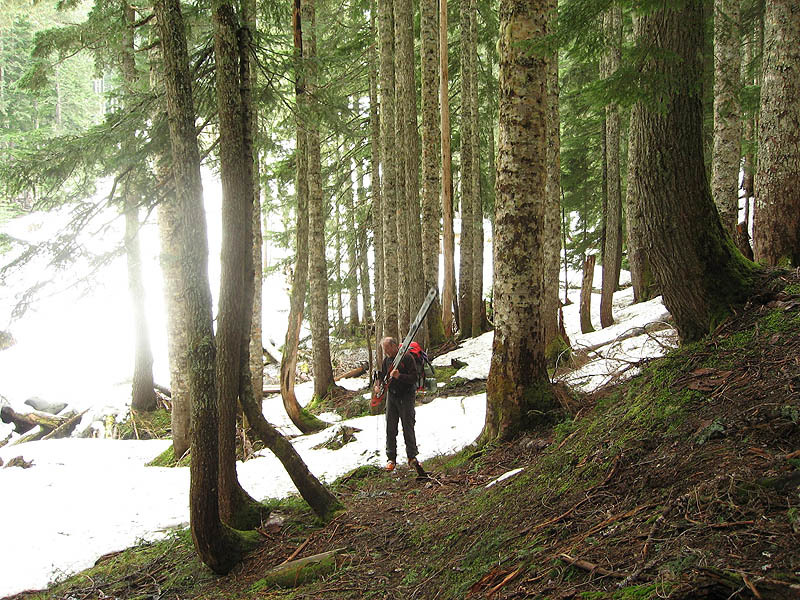 This turned out to be a good decision, as the path took us through the trees for about half a mile, across a small stream on a series of logs, and directly up the avalanche path to the southeast of Heliotrope Ridge. Kevin vaguely remembered a description of this route on Amar's website, which pegged it as a place to avoid the crowds on the CD. 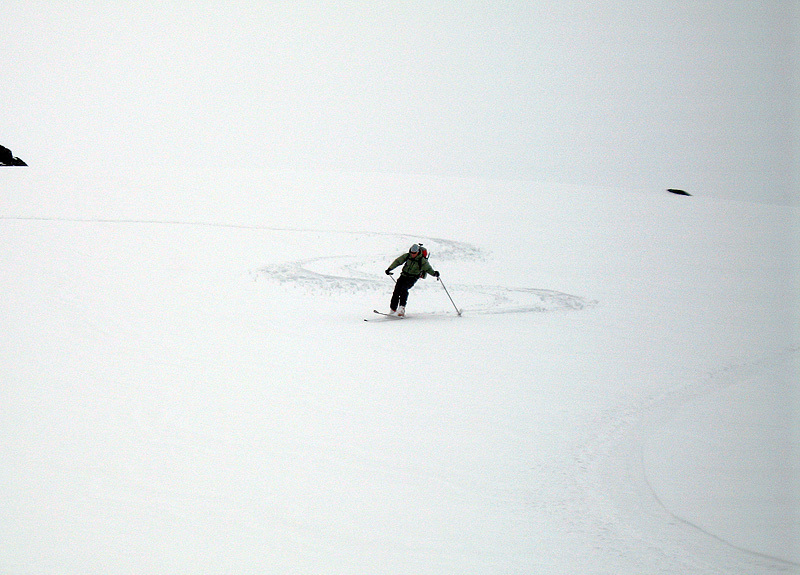 A group of three skiers passed us on their way down and seemed stoked with the skiing. 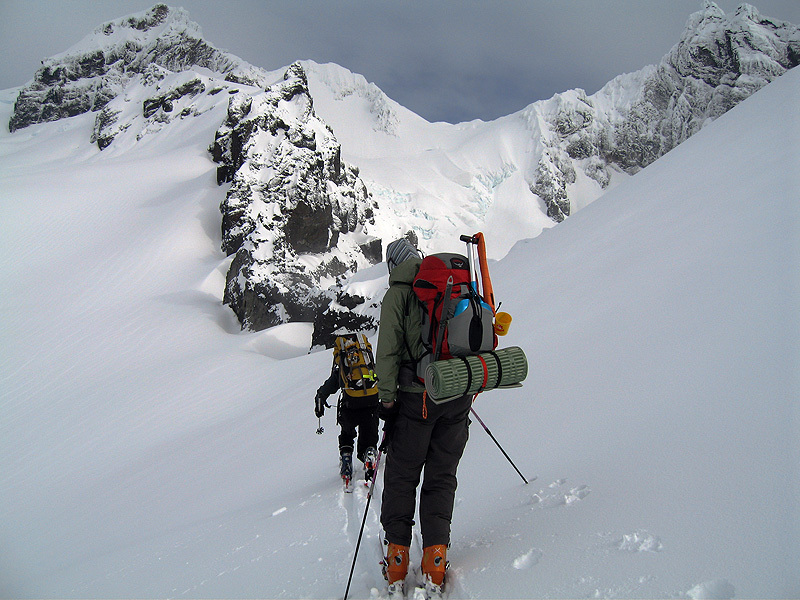 We followed a straight and fairly steep skintrack set (we presumed) by the skiers we had seen and made excellent time up the SE side of the ridge - a major improvement over the muddy and less direct summer/climber's trail heading toward the Coleman Glacier. A wet but pretty layer of fresh snow around 4 inches thick gave great traction and we hit the 6,400 ft. level in around two and a half hours. From here, we angled climber's left in a slowly ascending traverse to join the traditional route, and found ourselves alone at the traditional overnight spot in the shadow of the black cliffs. The "toilets with a view" had not been flown in yet, and there were no signs of other campers, though two climbers from Portland arrived about half an hour later and introduced themselves. We threw down the bivies, which were a new experience for Frank, who dubiously kept regaling us with stories of the great food and down comforters in the huts of Europe, and settled in to cook Kevin's version of Middle Eastern Mexican food - tortillas with spicy couscous and hot chicken sausage. 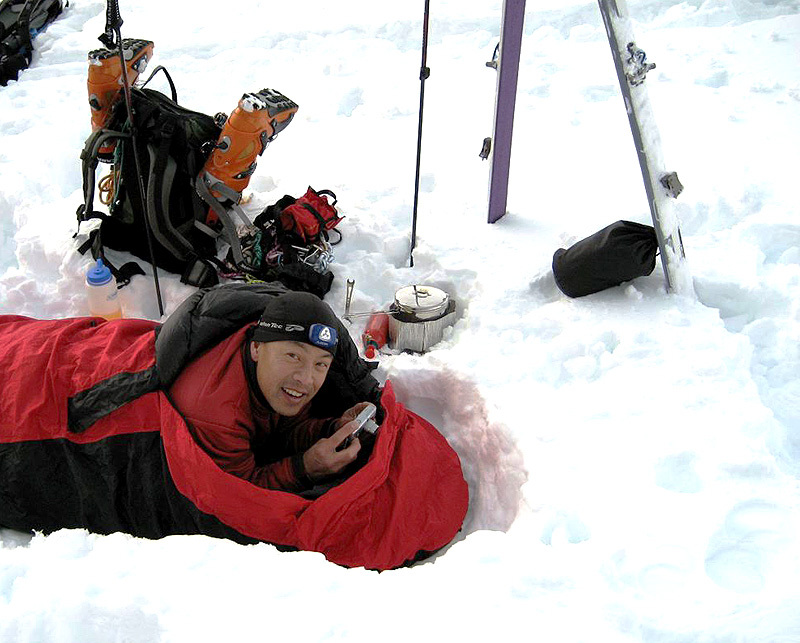 I was perfectly happy to remain in my bivy for the rest of the evening, while Kevin skinned up a few hundred feet for digestive purposes, and Frank stood around shivering trying to decide between the claustrophobia of his new bivy and warmth. The next day dawned cool and foggy, with a slight mist in the air. None of us was especially excited to get up and take a crack at the summit, but our climber neighbors finally headed up around 6:00 AM. The large group of club climbers who had camped a few hundred yards down the glacier apparently decided to pack it in and go home, as none had passed us during the early morning and they were still milling around at camp. 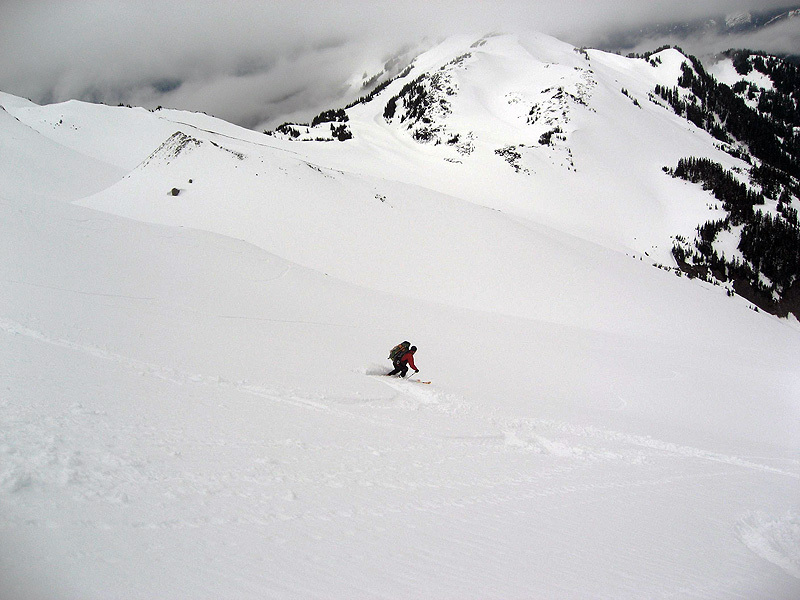 The small rodents who during the summer months spend the hours between dusk and dawn scampering over your sleeping bag and gnawing holes in your pack looking for food must have still been in hibernation, as they were nowhere to be seen. 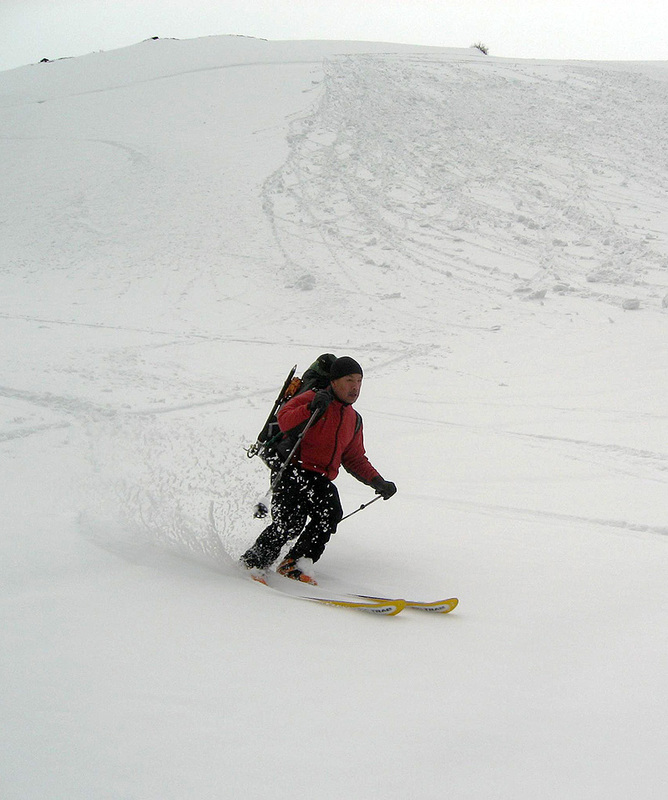 Frank decided he was uncomfortable with the prospect of skiing in poor visibility over glaciated terrain, so Kevin and I reluctantly roped up as a two-person team and headed out. I reminded him not to fall into anything if possible, as I had practiced a solo crevasse rescue once but it was not exactly a sure thing. By this time, the visibility at camp had improved dramatically, but the cloud deck was thick and menacing about a thousand feet above us. 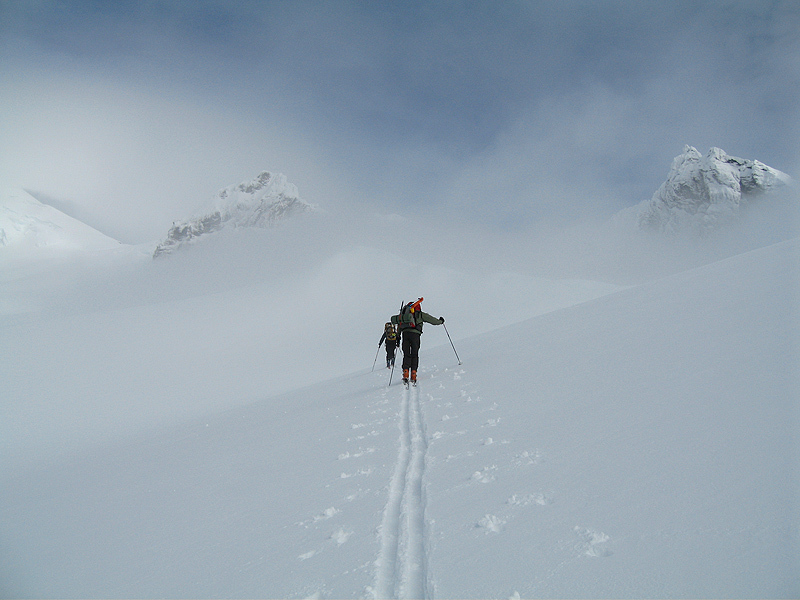 We made good time following the showshoe tracks of our campsite friends, but soon after entering the cloud layer we encountered them descending, saying that they had run into really poor visibility and sounds of "avalanches" just above. Kevin and I wished them a good day, and headed up into very thick clouds. Shortly thereafter we reached their turnaround point, after which we were running on GPS waypoints from our trip in 2004. At the ridge leading over onto the Deming Glacier, around 9,110 ft., we skinned around the corner to get out of the wind (so technically I guess we were on the Deming Glacier, but just barely) and reassessed seriously. 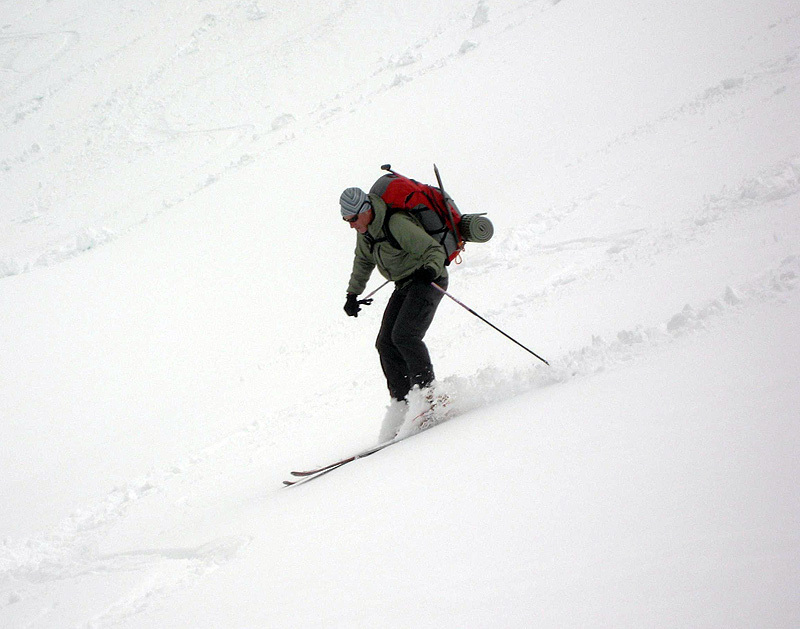 The visibility had gone from 50 to 10, while the wind had gone from 10 to 50 in the last 1,000 ft. A mutual decision was made to ski slowly down while roped until we reached better visibility or the open snowfields above camp. Slow it was. Kevin led off, with me whipping the rope back and forth like a waterskier to keep from running over it. We made turns, but they were embarrassingly lame stem affairs at about 4 mph. Got us down, though. 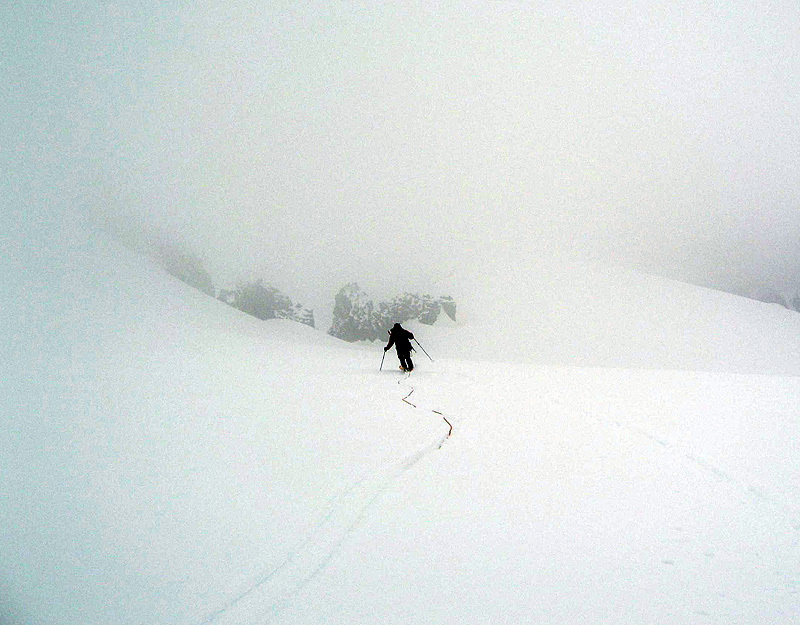 When we reached a point with a little better visibility, we unclipped and I skied with a 20 meter rope tail down to camp. Frank was already packed, so we loaded up in a drizzle and performed the long traverse in some very sticky mank back to the avalanche path. 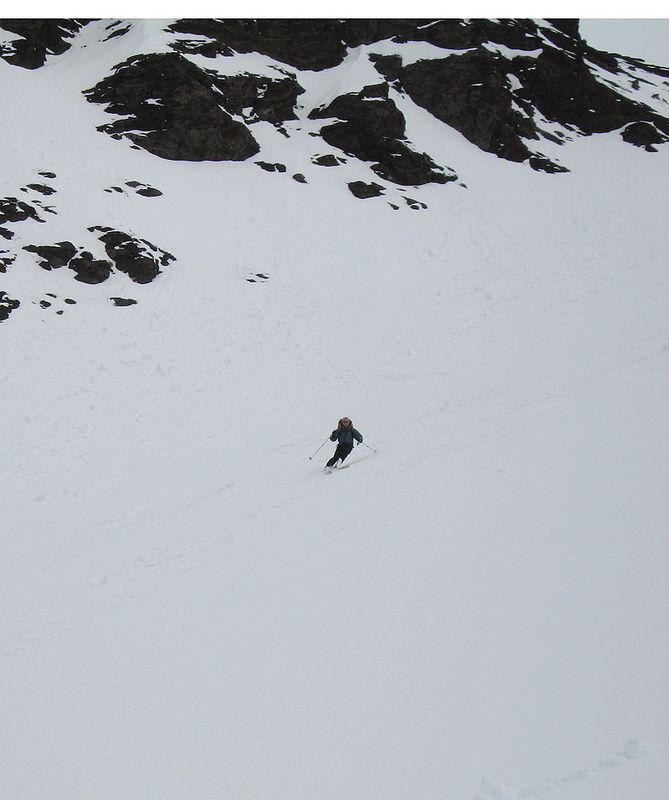 Some reasonable turns were had down to the road, but heavy packs and tired legs lessoned the enjoyment level a bit. We performed the requisite "it could have been worse" rites, headed back to Graham's for more coffee, and rolled I-5 back to Seattle. 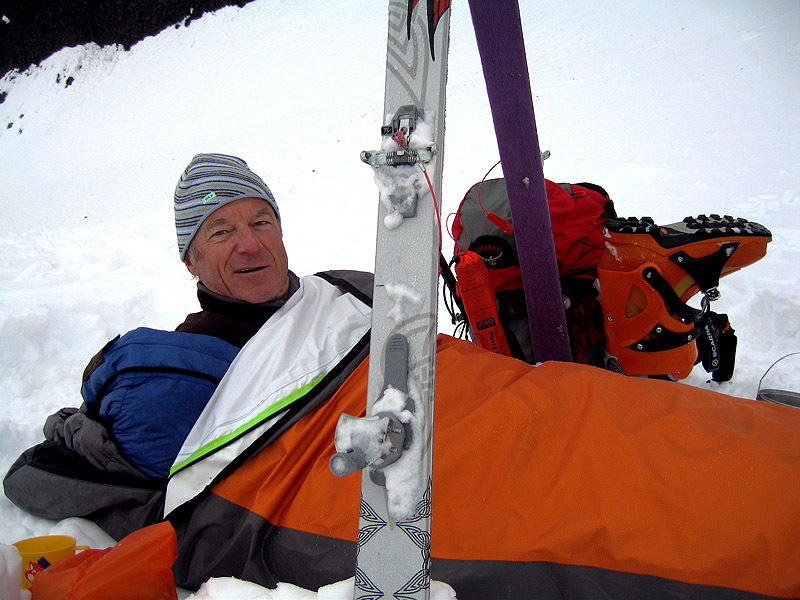 Frank's conclusion about camping in a bivy? He's still thinking about it!